Ahoy Mateys! 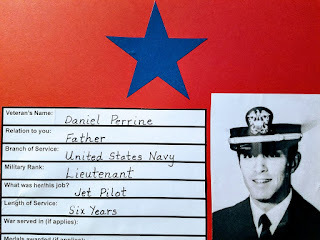 Veterans Day is around the corner, and I want to share with you an activity I did with my little scallywags to honor our friends and family members who have served or currently serve in our country's armed forces. First thing on my list was to gather children's books about Veterans Day. These were displayed on the rain gutter tray mounted below the whiteboard. (The rain gutter idea came from Jim Trelease, the author of The Read-Aloud Handbook! When perched on the rain gutter, the books' covers are easy to view.) In addition, I searched for student-friendly websites for background information on Veterans Day. I introduced the topic of Veterans Day by asking my students what does "veteran" mean. Once we arrived at the definition related to the holiday, I distributed KWL charts and asked students to list in the "K" column what they knew about Veterans Day. I had also made a poster size KWL chart. After the kiddos had made their list, I had them share their knowledge with each other and called on volunteers to write on the class chart. We then brainstormed questions we had about the holiday and wrote these in the "W" column. Next the kiddos gathered on the carpet in the Reading Corner for a read-aloud of Veterans Day by Rebecca Rissman. This book provides information on the history of the holiday and how it is celebrated. After the reading, we returned to our KWL charts to write in the "L" column the facts we learned from the book. I explained that we would create a Veterans Wall of Honor on the wall outside our class door by displaying the information forms. In addition, I encouraged them to bring photos their families or friends might have of their veterans to place on the wall as well. For students who did not personally know a veteran, they were assigned to write a paragraph about the "Who, What, When, Where, and Why of Veterans Day". These would also be displayed on the Wall of Honor. Throughout the rest of the week, we continued to read more Veterans Day books and view the various VD websites. On the day that the assignments were due, I provided students with red construction paper on which to glue each cut-out form and photo. Students who wrote paragraphs also glued their writing to the construction paper. Once that was completed, I distributed blue and gold stars. I explained to students that during World War I a family tradition began of placing in the home window a white banner with a blue star to honor a family member actively serving in the armed forces. Later another tradition was started. Gold stars were sewn onto the banner to honor family members who died while serving their country. 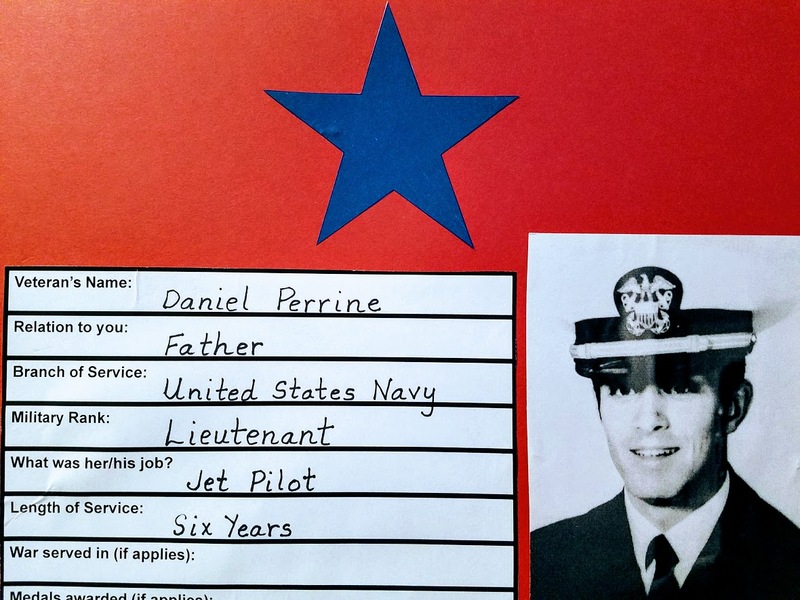 Students then glued the appropriate star above the Veteran Information Form to the red construction paper. After school that day I hung the red construction papers on the hallway wall outside our door. The students were very excited to see the Veterans Wall of Honor when they came to school the next morning! 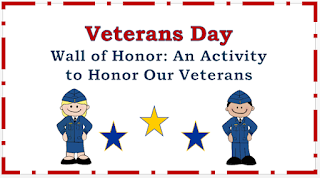 If you want to create a Veterans Wall of Honor with your students, click on the picture below. 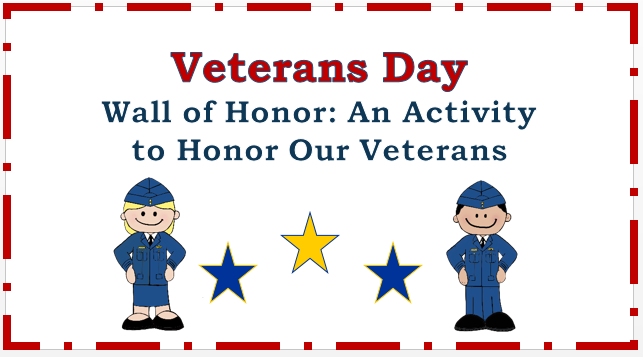 This FREEBIE contains the resources and directions for completing this project to honor and remember our veterans. Thanks for docking your ship here for a while, me hearty. As you sail on to a new adventure, I wish you well! By now ye and your little scallywags are settled on board for another year of sailing in the Sea of Learning! And the Pirate Queen has some teaching treasures to help keep the wind at your back. The four categories of sentences are usually taught early in the school year. In 2nd and 3rd grades the category names are in simpler terms: Statement, Question, Command, Exclamation or Feeling. While in the upper grades, the names become more sophisticated: Declarative, Interrogative, Imperative, Exclamatory. One of the best ways to practice categories is a sorting activity. The free product below provides a set of ten sentences minus the ending punctuation. Students must read each sentence and use their knowledge of the definition for each type of sentence to decide which category each individual sentence belongs. Click on the picture to preview this product. With baseball playoffs scheduled in the fall, I chose to write sentences related to one of America's favorite pastimes. This particular set of sentences honors legend, Lou Gehrig. Once the sentence strips are cut out, students read each sentence to determine the category and place the sentence below the category label. A recording sheet and answer key are also provided. A second ELA area that is often reviewed or introduced early in the school year is story elements: Characters, Setting, Plot. 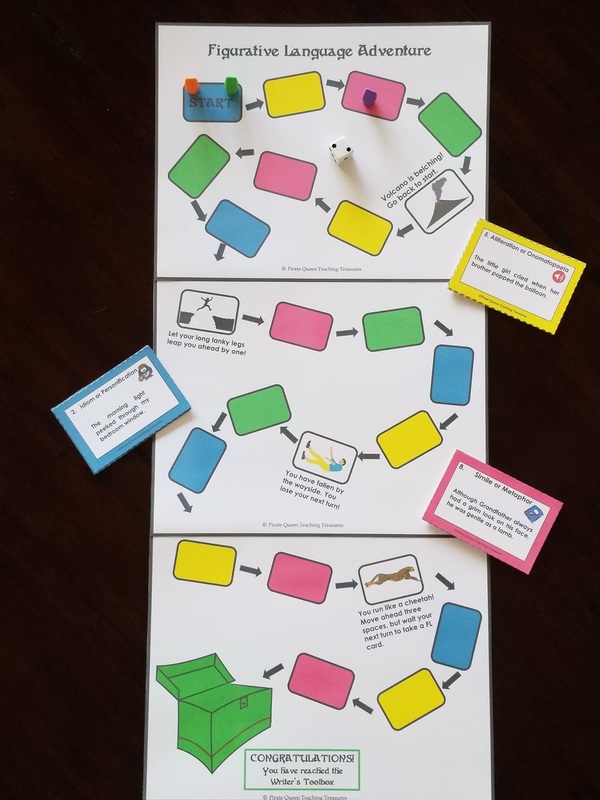 This Freebie assists your instruction and provides students practice in identifying and explaining the setting of a narrative. Click the picture to preview the Free product. 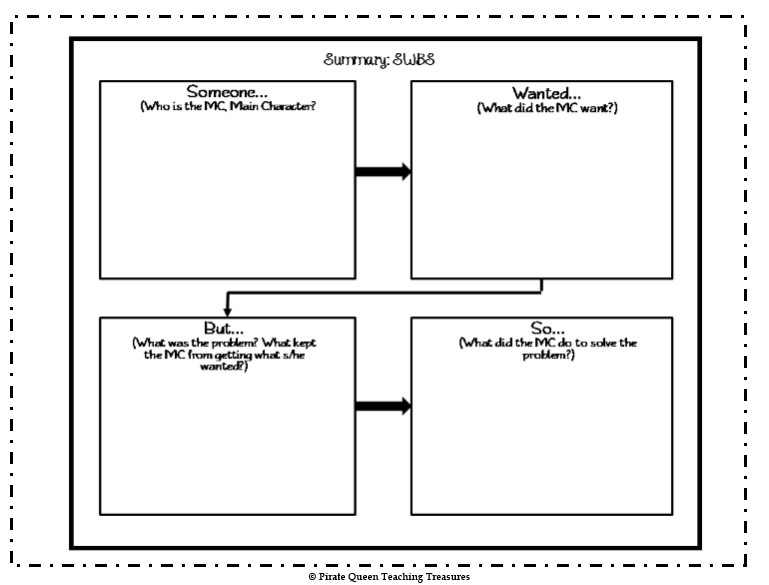 A graphic organizer setting map and sample are included in the Freebie. Also provided are questions that can be used for class or group discussion as well as for written response. These resources can be applied to any narrative form. Many district math curriculum maps begin the year with Place Value. In keeping with the seasonal time of year, these task cards ask questions about the number of pumpkins in the pumpkin patch. Understanding that ten ones is the same one ten and that ten tens is the same as one hundred is the key to place value. Solving the riddles help students to grasp that concept. Click on the picture to preview the product. Each of these Practice Freebies is part of a larger product that provides additional resources and more practice. If you like any of the above treasures, check out the ones below. "They be worth their weight in gold, me hearties!" Kinds of Sentences Sort will provide 30 more sentences to sort. Novel Study Resources includes graphic organizers for all story elements, theme, vocabulary, and summaries and can be used with all narratives, picture book stories, and chapter books. Pumpkin Patch Place Value Riddles has 32 additional task cards giving your students the opportunity to build their understanding of multi-digit numbers. Happy Sailing, Buckos! See you next month! Labor Day is approaching, and the Pirate Queen has a fun activity for your students and their parents. If you ask children what kind of work their parents do, they are probably able to name the job or profession of their parents. However, how much do they really know about the details of the work that their mother and father do most every day of the week? To teach students about the history of Labor Day, I have created a FREE product that provides background as to how and why a holiday was created to honor American workers. In the process, students also learn about the type of work their parents do by interviewing their mom or dad about her/his job. Before introducing Labor Day to your students, gather books from your school or local library about the history of this holiday. (A list is included in the product, Labor Day: Worker Interview Activity.) Display the books to encourage students to review, and select a few to read to the class for background. 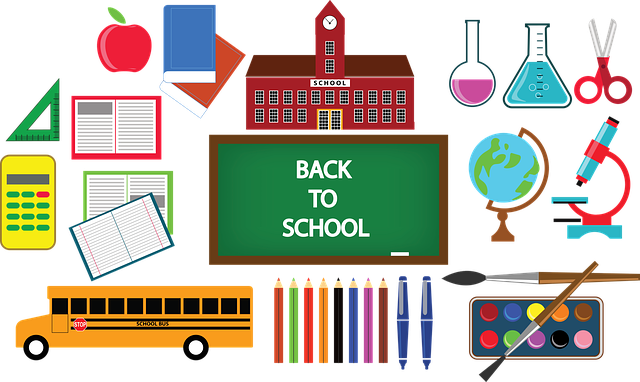 In addition, I recently added to this Labor Day resource an up-to-date list of websites dedicated to the holiday, including a few that are designed for children. When you are ready to begin this mini unit, ask students general questions such as: What are jobs? Why are there jobs? Ask students if they have thought about what they want to do when they grow up. Discuss various careers and make a chart listing different professions and their purposes. Introduce the word, labor. Ask students if they know what it means. Then remind them that Labor Day is approaching. Ask what they and their families will do to celebrate. Be sure to ask why do we have a day for celebrating labor. At this point, show one of the websites or read one of the books to help students understand the reason for Labor Day. After a day or so on the history of Labor Day, talk with students about their parents' jobs. Ask if any of them have been to their parents' work place. Ask students what their parents' work day is like. Some students may know quite a bit about the work their mothers and fathers do. Others will know very little. Distribute the Parent Letter/Interview Questions and go over the questions with students. Remind students that they are to choose one of their parents to interview. Make sure they understand that "Stay-at-home Moms and Dads" can be interviewed. After interviewing their parents, students will present to their classmates information regarding the type of work their parents do. Also, if possible, students will bring a "Tool of the Trade", something their parents use to do their work. For example, if a parent is a nurse or doctor, the student might be able to bring a stethoscope, a "Tool of the Trade" in the health profession. Presentation Scoring Checklist and go over the characteristics of a well done speaking presentation. Model for them how a speaker should stand, how to make eye contact, how to hold and present an item for viewing. Suggest that when they practice their presentation at home, their parents can use the score sheet to evaluate the student's presentation and help the student to make improvements. Set aside three or four days for students to share what they have learned about their parents' jobs. I recommend taking photos of students holding the "Tool of the Trade" their parents use. These photos along with pictures that students draw of their parents at work can be displayed on a wall in your classroom or in the hall outside your classroom for others to see. If you would like to download Labor Day: Worker Interview Activity, click on the product cover which will take you to my TpT store. I've been out of touch. But now I'm ready to sail again into the vast Sea of Learning! While on leave, I created a gem of a teaching product, Novel Study Resources for Grades 3-5. Knowing how time consuming creating resources and printables for each chapter book read during a typical school year is, I collected various graphic organizers I had designed for specific books and edited them to work for any fictional narrative. This TIME-SAVING treasure can be used with any novel or chapter book for Intermediate grades. Nine graphic organizers, which I like to think of as treasure maps, help students organize their ideas and thoughts as they read and analyze the narrative. 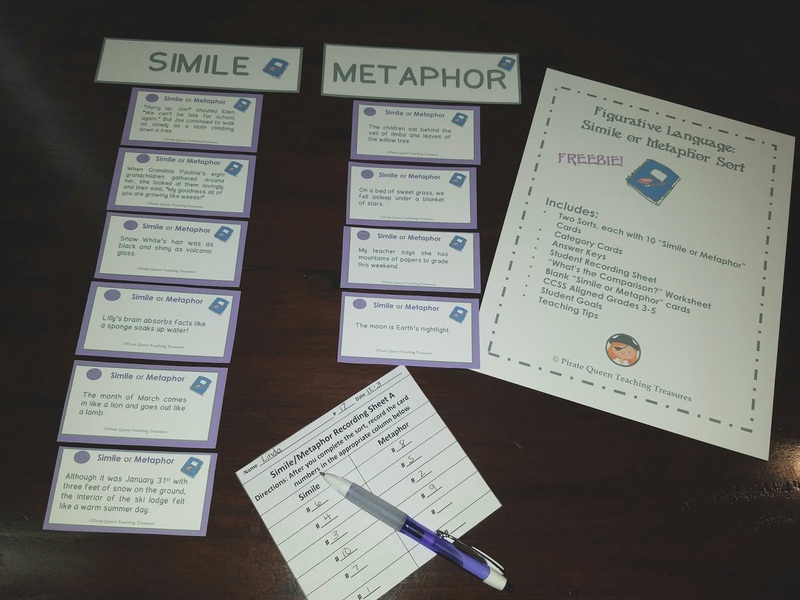 These printable organizers for characters, setting, plot, theme, and vocabulary can be cut out and glued into reading journals. 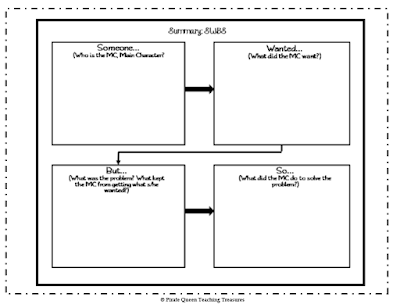 There are also organization maps to assist with writing summaries. Working samples of summaries and graphic organizers are included so teachers can show students how a finished product might look. 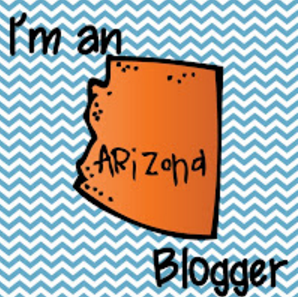 In addition 40 discussion and/or written response questions are provided. Some cover story elements. Others explore various fiction genre: realistic fiction, fantasy, historical fiction, mystery, and science fiction. As a bonus, I created a mini anchor chart identifying these genres and listing their characteristics. You may want to choose some of the questions as an assessment. Finally, Common Core ELA Standards to which this product aligns are listed for you, and teaching tips explain how to utilize each of the resources with your students. Click on the Novel Study Resources cover above to preview the product. If you want to try out a small piece of this product, then click on the Setting Teaching Resources FREEBIE below. I hope you find these treasures helpful, Mateys! If you do and if you have suggestions for other teaching products, please leave a comment below. Argh! U.S. Measurement...Plus a FREEBIE! I realize my banner says: "Language Arts Treasure for the Intermediate Classroom". However, every once in a while I will offer a mathematical gem that I hope you find useful. U.S. measurements are not easy. In many cases, they are quite frustrating for children and adults alike. I bet you have asked the question: Why don't we use the metric system here in America? I certainly have! 5,280 feet in a mile; 16 ounces in a pound; 8 pints in a gallon! How are we supposed to remember these equivalencies? Well, most of us memorize if we can, and yet the numbers don't often stay with us. Of course, if we use the information frequently or on a regular basis, it will stick with us. But how often do kids use this kind of knowledge? Memory techniques such as mnemonics and songs can be effective. When I took piano lessons, I learned the treble clef line notes by reciting this mnemonic-- Every Good Boy Does Fine. I also am able to remember how to spell the word, encyclopedia, after learning a song sung by Jiminy Cricket on the original Mickey Mouse Club TV show! And how many of us have fond memories of School House Rock? "Conjunction Junction what's your function?" "Hooking up words, phrases, and clauses." So here is a math gem for you. Math Lessons by NUMBEROCK, a TpT store, has numerous songs and music videos to help you teach math concepts including measurement, both U.S. and metric. And here's a gallon story, although not technically a mnemonic, found on Pinterest to assist students with U.S. capacity equivalencies. Together the Gallon Castle visual combined with the story of the four Queens is very useful for remembering these unit equivalencies. Of course, memorization isn't enough. Students need to interact with the measurement equivalencies. One way is to apply those equivalencies to mathematical story problems as in the sample below. ...and here's an additional product that will provide more practice opportunities for your students. Finally the best learning experience for U.S. measurement equivalencies is real life events. Cooking dinner or baking cookies with Mom or Dad, weighing fruits and vegetables at the grocery store, and helping measure a garden plot in the backyard--these are real experiences that will help those equivalencies stick. So here's a final gem, No Bake White Chocolate Raspberry Cookies! Have a "no baking day" with your students or send the recipe home for a family chef night! Click on the picture below to link to the Super Healthy Kids website where you will find this recipe and others! Thanks for dropping anchor! Happy Sailing!